Peas are a hardy vegetable that grow best in cool weather. Peas do not transplant well. Plant peas directly in the garden 9 weeks before the frost date. Plant them as soon as the ground is no longer frozen and the soil can be worked. Plant peas from seed 10 weeks before the fall frost date. Amend soil with lots of compost and fertilizer (chemical or organic) at planting. Avoid adding nitrogen fertilizer after planting. This will stimulate leaf growth but delay fruit. I use a “blooming and rooting” fertlizer (9-59-8) to promote flowering and pod production. Harvest snap peas (edible pods) when the pod is full-size, but the peas are still small. Harvest snow peas while pods are still flat and before peas develop. Snow peas are not shelling peas, neither are snap peas. Garden peas are for shelling, but it takes A LOT of pods to get enough peas. That’s why the snap peas and snow peas are nice, because you eat the pods. Snap peas look like regular peas, just with edible pods. Snow peas are flat. I’m new to gardening and didn’t really know the difference in pea types. I planted snow peas and cannot find anywhere if these are peas I can shell and freeze (if they get plump) or if they are meant to only eat whole (slightly flat)? I was hoping to be able to do both but could not find a site that mentioned both processes. That would probably be good. I’m guessing they need a boost of compost tea or fertilizer. I have some peas that have grown to about 6 inch tall and stopped. They look fine, and are actually getting blossoms but aren’t growing anymore. It is the weirdest thing. Anyone have any idea what may be the cause? Nope, the peas will be just fine! I’ve had mine go through snow and frost, and they do well. In fact, this last year I planted the earliest ever, and had the best pea harvest! You mentioned that peas can be planted outdoors 9 weeks before the frost date for spring planting. I have never planted BEFORE the frost date. Would I need to cover the garden at night, or would the peas survive the nightly frosts? You will need to replant every year. 10 weeks is how much time you need to plant peas to get a harvest before the freezing temperatures hit. If it’s still really hot, be sure to water regularly and maybe offer some shade. Regarding Peas: if I plant them 10 weeks before the frost (oct 21 for Orem) won’t it be too hot to get the peas out of the ground? I have a fall planting schedule–if you signed up for my newsletter and chose a fall color, you will get reminders of what to plant when. It’s different for each plant. Oh, and I forgot to mention. I planted peas in a half whiskey barrel container in rich garden soil. They’re about 3″ high now and no sign of blossoms or peas. April and May were very cool here, even some frosty nights, but now it’s in the high 50s at night and 70s, even 90s during the day. Should I give up on peas this year and harvest the greens for salads and then plant for fall? Your advice is appreciated. You mention numerous times “plant for fall harvest,” but it’s not clear to me when to do that for cool-loving plants like peas, beets, kale, lettuce, etc. Should these all be planted at the same time for a fall harvest? I’m in eastern Connecticut near the University of Connecticut. Would late July be too soon? Too late? Help, please, and thanks! I would try fertilizing them. It’s your best shot. Remember, low Nitrogen (first number) high Phosphorous (second number). Jerilyn–How tall are your peas? I would say if it’s getting really hot like that, the peas won’t last long. If you can, give them shade and water them consistently. I highly suggest Fertilome Blooming and Rooting (8-59-9) or something similar, as it will help the plant flower and produce fruit. I’m doing peas for the second time. Just like last time they’ve got little flowers but no signs of a pea pod…. did I not plant them early enough? I’m in orange and it was in the 80s and 90s last week. I assume Miracle Grow is a fast release fertilizer like any other. Apply it according to the directions–some kinds you mix with water, other is liquid and you dilute it, other you can put right into the soil. What about Miracle grow? Can I use it all over and in the dry form just mix it into the soil? This is my first year doing SFG, not sure how to do or make a trellis for the peas and do you leave your markers for the squares down all year or just at the beginning? Liz–I’d pull them, and plant green beans! Those will harvest in time to plant peas again for the fall. Thanks Emily – We’re already in the 80’s and have been for the past couple weeks. I have a screen over the entire set up to help with bugs and heat, but doesn’t seem to be helping the peas. Boo. Any suggestions on what to do with the plants?? I hate to just pull them up, but they are taking up good space that I could use for something else. Thanks!! Biff–First, confirm that you are growing vining peas, not a bush variety. Second, it sounds like you could use a little nitrogen and phosphorus boost. Try a complete plant fertilizer that is higher in phosphorus. Learn more about fertilizer here. If that doesn’t work I am guessing your peas have a disease–both types that cause yellowing are due to poor drainage in the garden and/or overwatering. Liz–Unless it’s hot (over 75 degrees) you’re not too late to grow peas. I’d suggest fertilizing with something high in Phosphorus (x-X-x) to help the blossoms develop. 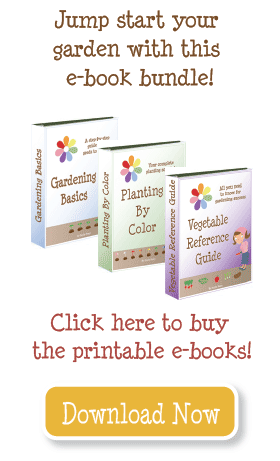 Read more about fertilizing your garden here. Hi Emily! So I made my first attempt at planting sugar snap peas about 2 months ago (FL – white group) and I have these really nice pretty plants but not a single sign of a pea pod. Maybe I’m just anxious, but when should I start seeing signs of actual peas growing? Maybe I got them in too late? Thanks! LOVE your site! It’s been really chilly, so I’d give them a little longer. But you can go ahead and replant–you might just get two sets coming up! I’m in the yellow group (North Salt Lake – not too far from the airport) and planted my peas on 3/2 but they still haven’t come up yet. It’s been a little cold, but nothing too out of the ordinary (we did have a pretty good snow storm but it melted within a day or 2). Am I being too impatient, or do you think I should replant? Yes, the peas definitely stop producing–for me it always gets too hot in July. You can clear them out, and you might have time to grow beets or lettuce (though it’s probably too hot for that, too). Or just wait and replant peas for a fall harvest. 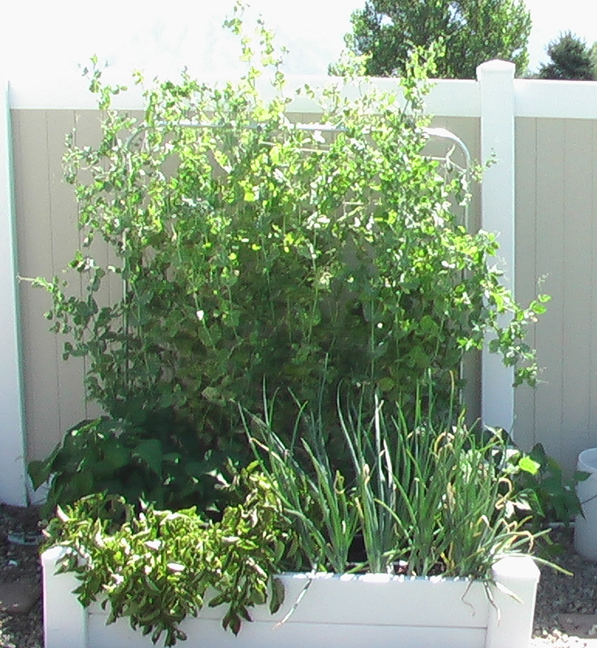 Peas put nitrogen back into the soil, so it’s a great plant to rotate around your garden. When do peas usually stop producing? Can you clear them out and move a transplant over to, and maybe again for the fall planting? I don’t think you could really fit two trellises in one square. But trust me, I never plant more than 4 squares of peas and we get more than we can eat! As for the fertilizer, I’ve found it at the IFA (Intermountain Farmers Association) in my area. I’ve also seen it at local nurseries. So long as you go for a similar mix (x-x-x) you should be fine. Hi Emily, I’m reading the above comments and wondering if you could do the 16 and trellis 2 rows of 8? has anyone tried this? I am using only one box and would like to get as much as possible out of it. Also, where can I get this fertilizer you talk about? That makes sense! I had only been thinking of a trellis on the outside of the box, which is what I’m planning to do. Why 8 and not 9 per square foot? I’ve read the book front to back and can’t figure this one out. What pattern do you use for 8? Nichole–you have found an area where Mel and I go our separate ways. He insists that if you use at least 5 types of compost and refill each square with a scoop every time you plant, this will provide enough nutrients for your garden. First, I have almost never been able to find 5 good types of compost (steer manure is not good). Second, I have done it both ways and find I have a much more successful garden when I fertilize. Now, some people prefer a totally organic method, which is great. I know there’s a bunch of concoctions you can make and spread on your garden to feed it. But the point is the same–the amount of nutrients in the soil is not sufficient. I feel you have to add stuff. So I use it on peas, beans, tomatoes, peppers, but not on root veggies (onions, carrots, garlic) or herbs. Thank you so much for your information. This is my first year giving this a try. I am busily preparing my soil and boxes to get my peas in. I am a little unclear though. In addition to the “Mels Mix”, is it necessary to fertilize the soil? I noticed you said you put “blooming and rooting” fertilizer down on your peas. Do you do that with all the plants and if so, do you use the same fertilizer on all your plants, or do you use a different fertilizer for different plants? Thanks for your help!